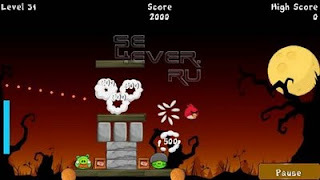 Angry Birds is the most popular mobile game on symbian platform. New version of Angry Birds Game launched - Angry Birds Halloween, I already posted two posts about Angry Birds with two different versions, In first post ,i posted about the 'Angry Birds 1st episode', It is the first version of the game. In second post, i posted about the 'Angry Birds- Lite' and 'Angry Birds- In the city '. Now, This version is advanced version of Angry Birds, it is a HD version of Angry birds. See the link below to download the game. To make it full screen : Go to Settings > Applications Manager > Installed apps > Select Application > options > Suite settings > On- screen keyboard > Off.